I’ve now finished my second week in Tenerife as a Divemaster intern and this week has definitely not felt as full-on and as hectic as my first week, possibly because now I am more settled and getting more accustomed to the early starts. My lack of a working underwater camera is still an annoyance but hopefully that should get sorted at some point this coming week. Diving-wise I had the pleasure of coming very close to two of our giant stingrays at Poco Naufragio, seen lots of cute and surprisingly docile cuttlefish and octopus, my first moray eels of the trip, discovered two new dives sites (although one was much nicer than the other, but I’ll get to that in a minute) and had my first experiences of El Porís and Las Eras. I would have dived Yellow Mountain this week had it not been for some videography championship having exclusive rights to the marine reserve, but I expect I will get to dive that site this week (fingers crossed). Instead we dived a new dive site ( well new to me as I have only been here a week! ) known as “Steps” due to its multilevel topography. We decided to try to find a new dive site. It’s always good to have new places to go, so even though there are more than 70 dive sites the team go to, it doesn’t hurt to have more!. Our attempt to dive a new site on the other side of El Porís, which just turned out to be a largely sandy-bottomed, urchin covered rubbish dump. Somehow I don’t think we’ll be diving there again! I have also improved my times for the 800 and 400m swims which I am very pleased about. More from me next week. Posted in: PADI Divemaster Intern Blogs, PADI Divemaster Interns. 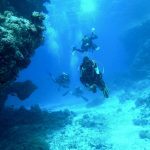 Tagged: Divemaster Tenerife, Diving in Tenerife, Diving Tenerife, PADI Divemaster internship Tenerife, PADI Divemaster Tenerife..